On April 19, 1995, I watched in horror as the news unfolded. A truck bomb had detonated in downtown Oklahoma City. There was an overwhelming sense of sadness, disbelief, and anger as my home was targeted. Who would have ever believed that the innocence of our state could be forever shattered by terrorism? Two weeks before the marathon, the world was rocked yet again when bombers struck at the Boston Marathon. This cowardly act of terrorism added to our plans as we as runners united in support of Boston. Runners, spectators, and volunteers all wore red socks in honor of the city of Boston. We were running to remember the lives lost and forever changed in Oklahoma City—and now in Boston! 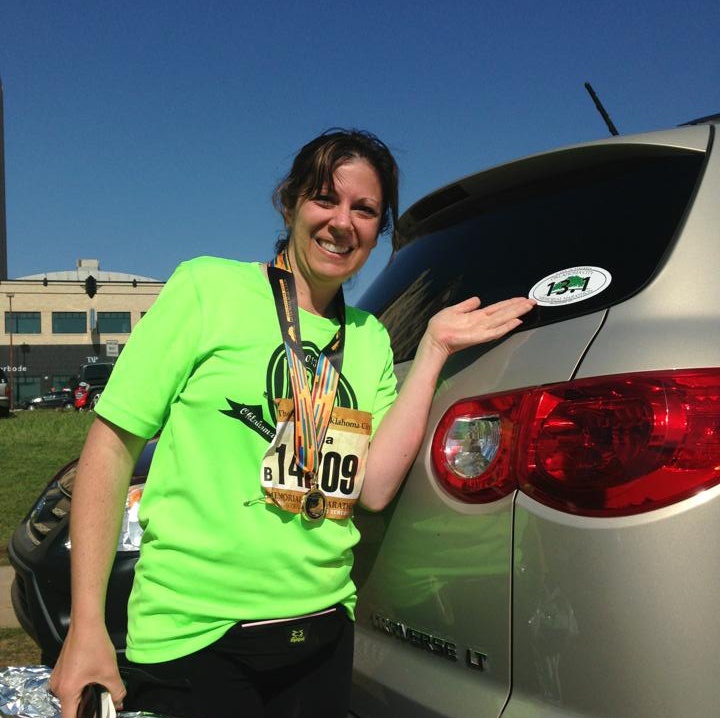 When I began training for the half, I never realized just how difficult it is to run 13.1 miles. I am not a natural runner; I only began running as a way to escape from the hurt and pain I was experiencing while I was going through my divorce. I would put on my praise music and sermons, and I would run and pray until my mind cleared. I would return home with a new perspective and a new attitude. It was during that first difficult year of divorce that I fell in love with running. It was where I met God face-to-face, where he wrapped me in love and peace and reminded me that He was still in control. It was where I began to forget the past and look forward to what God has ahead for me. I now know that pain is temporary. For the most part, I consider myself healed from the hurt and pain of my divorce. Running was a huge part of that healing. As I look back at the work God has done in my life through the past few years, I know that my troubles have produced a work that is far greater than the pain. And God is not finished! I know He has plans that are greater than anything I can ever ask or imagine (Ephesians 3:20). For a while after my divorce, I was very angry with God. I couldn’t understand why God had allowed this pain into my life. I had done my best to walk in obedience to Him all of my life, so I thought that I was supposed to receive the blessings of good—not the pain of betrayal and divorce. I remember thinking that the whole following God’s way hadn’t worked out very well, so I decided to live life my way. Fortunately, God loved me so much that He pursued me relentlessly until I returned to Him. It was when I surrendered to Him that I began to feel the peace and joy return to my life. I began to trust God again, and I found that my pain was truly becoming sanctified, something that would forever change me and be used for good by God. But, the path to healing is long and difficult. Like running a half marathon, it requires a great amount of perseverance. You must use muscles you didn’t know existed, working them to the point of exhaustion and near collapse. Then, you allow those muscles to repair themselves and they become stronger than you ever dreamed. The next time you hit the track, you find that you can go a little farther, a little faster. Week after week, you push yourself to the limit and find that your limit is a moving target. We are told repeatedly in scripture about the importance of perseverance. James says, Dear brothers and sisters, when troubles come your way, consider it an opportunity for great joy. For you know that when your faith is tested, your endurance has a chance to grow. So let it grow, for when your endurance is fully developed, you will be perfect and complete, needing nothing…God blesses those who patiently endure testing and temptation. Afterward they will receive the crown of life that God has promised to those who love him (James 1:2-4, 12). But, perseverance doesn’t happen automatically. It requires a process of training, being put through the fire until you learn to endure. The result is that we eventually become mature—and we receive the crown of life. We must run our lives in such a way that we are eligible to win the prize! As I was running the race, I realized that there were four phases: 1) The first mile or so is tough! It takes a while to get warmed up. 2) After running a distance, I began to settle into a pace. Running was quite effortless. 3) Around the tenth mile, my body began to feel the grind. I began to wonder if I could make it, and it took tremendous effort to keep pushing. I had to repeatedly remind myself that I was almost there. 4) As the Finish Line came into view and I heard my family cheering me from the sidelines, the tears began to well up in my eyes. I knew I had made it! With a final surge of energy, I powered across the finish! Isn’t that how it is in our Christian life? The first steps toward God are tough to take. We find every reason to quit before we ever really get started. Many get derailed at the very beginning because the journey just seems that it will be too long and arduous. But, for those who choose to persevere, they get into a groove. They feel that God is carrying them through the miles, and it seems almost effortless. Then, we reach a point where we become exhausted. It would be so easy to quit ten miles into the race, but we also know just how far we’ve already come. Quitting at this stage would be failing to recognize the progress we’ve made. Then, just when it seems we can’t take another step, we see the Finish line! We become overwhelmed with emotion as we recognize that we have almost made it. With one final push, we sprint across the finish line into the hands of our Savior who is waiting for us! God has given me a vision of the future He has for me, and I have taken some initial steps toward that future. I know that I am praying according to His will, so I cling to the promise that He hears and will answer. But, right now I can’t necessarily see His work clearly. The finish line is still a long way off! But, I feel as if I am in stage 2 of my race, gliding along mostly effortlessly, knowing that God is carrying me. He has given me His peace that surpasses all understanding to guard my heart and mind in Christ Jesus (Philippians 4:7). I know the days of physical, mental, and emotional exhaustion are ahead—the days when the race is in the final stretch and it would be so easy to throw in the towel. But, just beyond that stretch, God’s great finish line will come into view. I will be able to clearly see that His plans are unfolding, and I plan to sprint across the finish line into the glorious future He has planned for me! Right now, though, I need to embrace the journey. As I ran the race, I enjoyed taking in the view—the state capitol, the spectators, Gorilla Hill, and my mom’s favorite restaurant. I’d never seen these places from this perspective, and it was fun to take pictures as I ran. Even as I run this stage of my walk with God, I find myself soaking in every detail around me. I am enjoying the run and the view as I see His hand at work all around me. I enjoy taking comfort in His care as He makes preparations—some of which I know are invisible to me right now. It’s a journey to a deeper faith and perseverance, and I don’t want to miss even one moment of the race—even one moment of God’s tender care along this journey. My confidence is growing daily because I know my God cannot lie! What He has promised me will come to pass, but it is sometimes a long race to seeing his plans unfold. I must persevere in my faith and obedience, and I know that the end result is an unshakable confidence in the God who is carrying me!